With all of the benefits of fresh citrus juice, it only makes sense to have a CS-1000 Tribest Citristar Citrus Juicer. Citrus fruits are rich in Vitamin C, potassium, and many other nutrients that contribute to a healthy lifestyle. 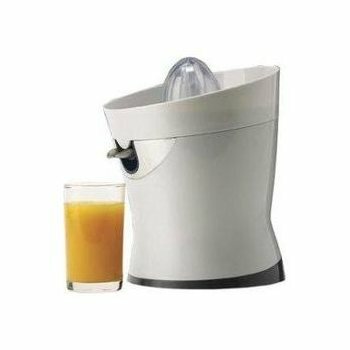 From lemons to grape fruits, the Citristar Citrus Juicer can juice any and all citrus fruits. The Tribest Citristar Citrus Juicer comes with a high-clearance stainless steel spout. This spout prevents clogging and helps keep maximum flow of the juice being extracted. This Citrus Juicer makes drier pulp, which drier pulp means more juice. Tribest offers a 1 year warranty on the CS-1000 Tribest Citristar Citrus Juicer. Finally, the Tribest Citristar Citrus Juicer offers a quiet operation. When you juice in the mornings the entire household doesn't have to hear it. The CitriStar is easy to use yet powerful. You can have fun juicing your citrus fruits and have the option to juice for several days into the future. Nothing begins your day like a freshly juiced citrus fruit. The unit has a universal ream so that it adjusts to small limes and large grapefruits. It also comes with a one year manufacturers warranty. Collector is sloped which eliminates clogging. Screen is also made from stainless steel. An auto start and stop operation. Adjustable cord length for easier storage. 50 watts for 110V (85 watts for 220V). 8 3/4"W x 8 1/4"D x 9 3/4"H (w/lid). Our customers are very important to us. If there are any questions or concerns when you package arrives, please contact us immediately. Your satisfaction is our goal and guarantee. We pay the shipping on all order over $125. We ship worldwide, please email us for shipping quote outside of United States. Fresh Start Juicers offers free shipping to the continental United States only. We do not offer free shipping to AK and HI, or Canada, but you can email us for a shipping cost. Some of our items ship directly from the manufacturer or distributing center. So if you order more than one item you may have separate shipments. We process and ship our orders same day if purchased by 4:00 PM Eastern Monday through Friday. We use ground service and you can expect to get your items within 1 - 6 business days. We will email you a tracking number so you can view its progress and estimated delivery date.